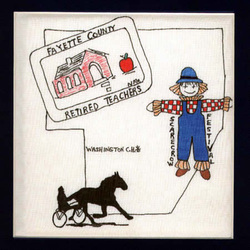 Fayette County Retired Teachers Association was organized May 9, 1968. The Fayette County Chapter was to be a service organization, a division of AARP. Its purpose was to aid the advancement of public schools, to foster good fellowship and to promote the interest and welfare of teachers.President Gladys Melson presided over the first meeting in August, 1968 with 24 members present. FCRTA has grown to 100 members in May, 2007 and meets six times a year.Since 1971 books have been presented to Carnegie Public Library in Washington Courthouse as memorials to deceased members. The "Banana Express" has delivered fruit and Christmas cards to Fayette County nursing homes since 1981. In 1988 an annual scholarship was established for graduates of Miami Trace High School and Washington Senior High School who plan to major in education. FCRTA members volunteer in many areas including churches, precinct work for the election board, Fayette County Memorial Hospital and local schools.FCRTA members don't return to school each fall, but they continue to share their lives and talents with the Fayette County community.